How many Baby Animals Can you Name? Game is a fun game and you can play it on your woodland themed baby shower, jungle, safari baby shower and also on zoo baby shower party. It can also be played on a baby shower with any other theme that you like. On this page I am sharing game cards for this game in three different colors. I have made the cards in blue, pink and gender-neutral orange colors. How to Play: Print and distribute the game cards among the guests along with something to write with. Set the timer to 3 minutes on your phone. 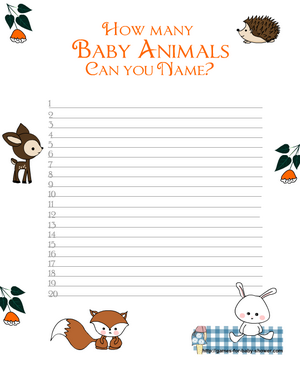 Ask the guests to write down the names of as many baby animals as they can in these 3 minutes. Tell the guests that the name that they write should be of the baby animal and not the adult animal. Like the guests should write hatchling and not frog, they should write cub and not lion. The person who write down maximum number of baby animals name will be the winner. This is the first color of this cute printable game that I have made for you. This game card has an orange title and it is decorated with orange flowers. This game card is decorated with images of many cute wood-land animals such as a little fox, rabbit, deer and a hedgehog. All the images that I have used in these games are made by me and you are not allowed to copy or steal any game from my website. This is another color that I have used to create a game card for this game. This game printable had a blue title and it is also decorated with blue flowers. Just click on the thumbnail image of this game and a bigger image will open up, right click and save that. I have also made this game in Pink color for a girl baby shower. This game card is decorated with a title written in pink color and also many pink flowers. You can print this game if you like this color more.